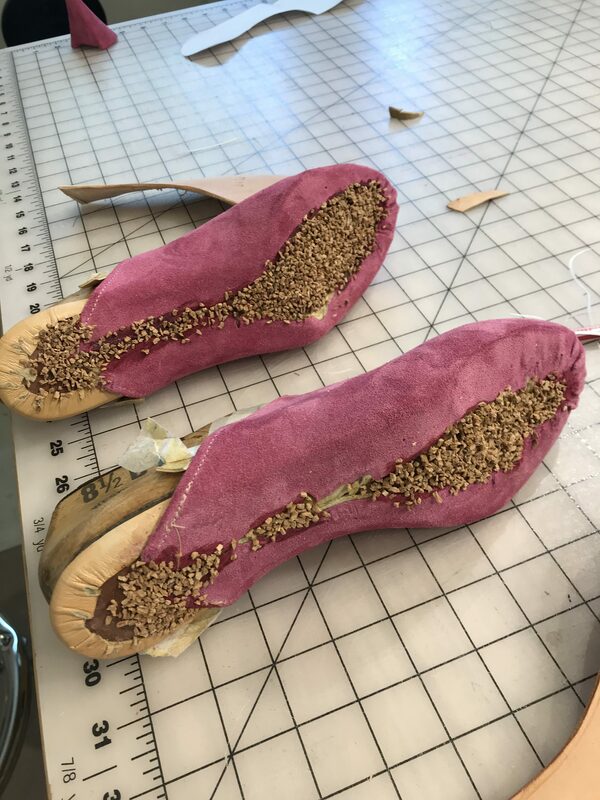 I’ve made many pairs of shoes since the last time I posted about shoemaking on my blog, so a post on where I am in my journey is long overdue (and if you are interested in seeing a more extensive view of my makes, feel free to follow me at jasikaistrycurious on instagram)! Sandals have been my go-to shoe make for a while now because, for me, they are fairly quick to complete (I can start and finish a pair in a day) and are a bit more goof-proof since they don’t require lasting. The first sandal class I took that I LOVED was with RachelSeesSnailShoes a few year years ago, and I must have made at least 15 pairs of sandals for myself and family members since then. 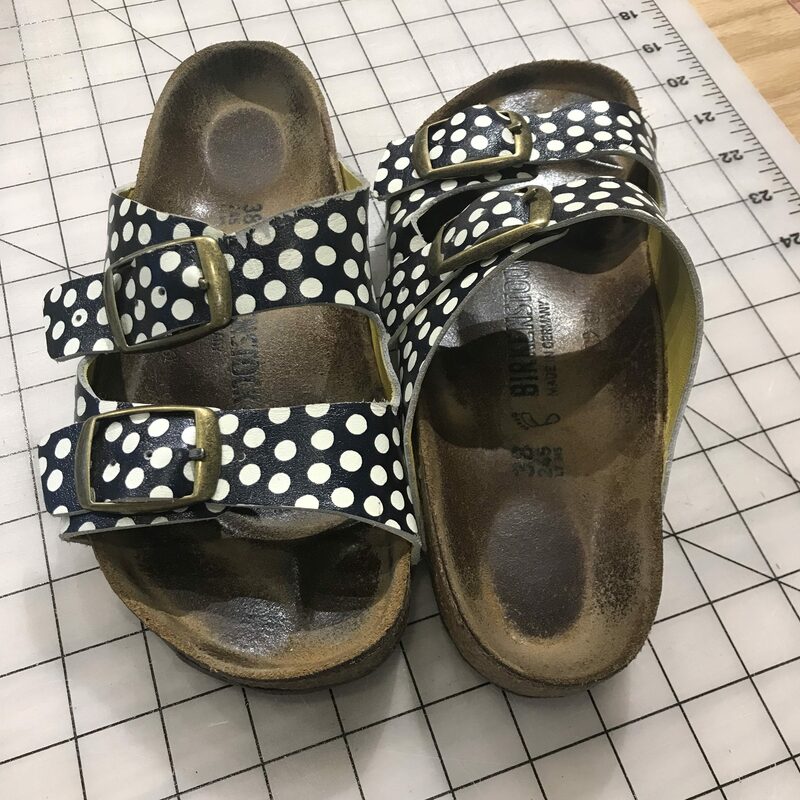 I’ve also made Birkenstocks (there is a shoe components store here in Los Angeles called Sadermo that stocks authentic Birkenstock footbeds for $36- all I have to do is design and attach the upper and the rubber sole- I should probably do a blog post on these, too, yeesh). 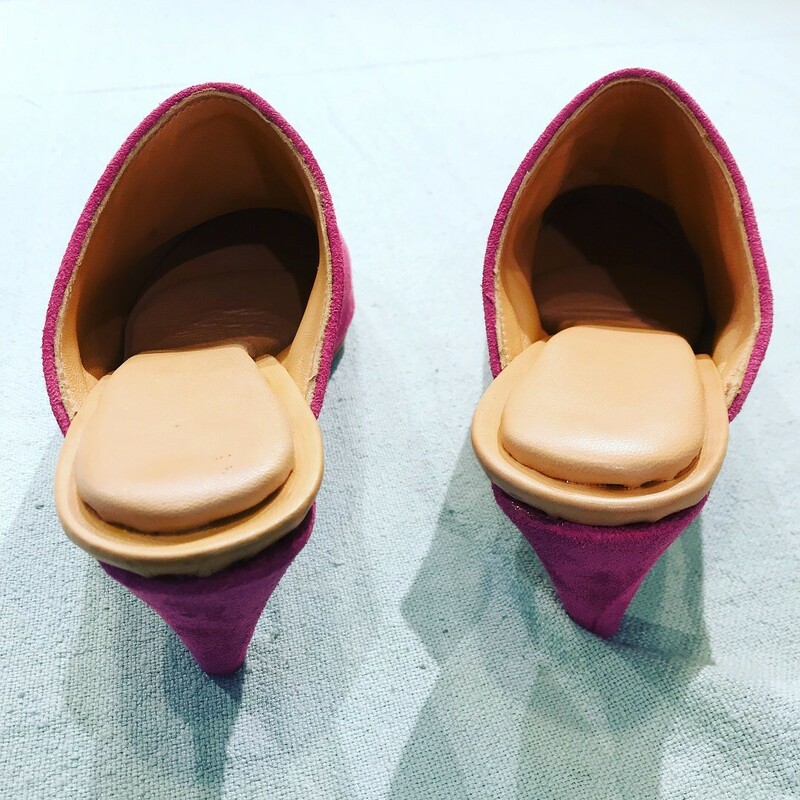 The whole process has been so fun and enlightening and I wear my memade shoes all the time, but completing a pair of wearable high heels has eluded me…til now! I actually got my start in shoe making with heels. 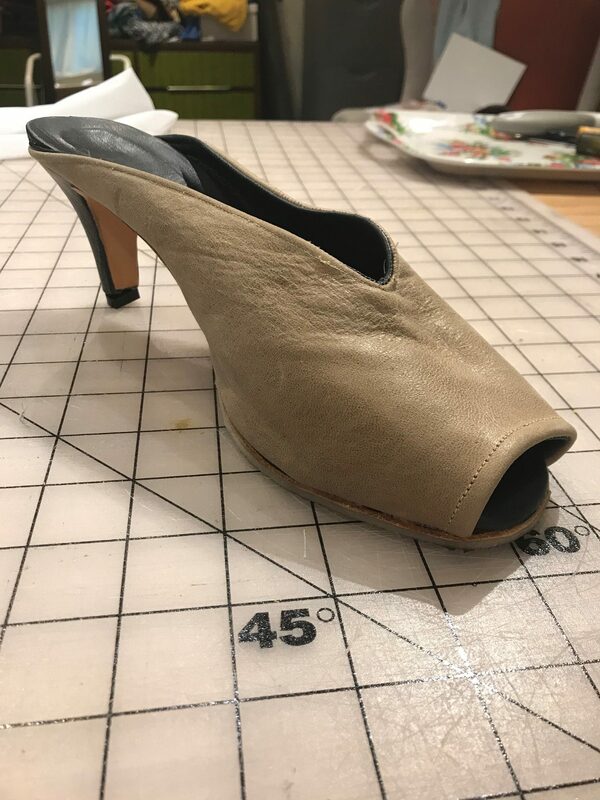 After reading the independently published book Make Your Own Shoes by Mary Wales Loomis (more on that book and the beginning of my shoemaking journey here) I started with a pair of 2.5 inch mid- heel components and some vintage shoe lasts and made my first pair. Although they looked pretty impressive for my first time doing it, they were far from perfect; the heels felt wobbly so I knew better than to wear them out and risk breaking my ankle, and the rubber soling I attached to the bottoms to keep them from being slippery were way too thick, more appropriate for the bottoms of rain boots than slip-on heels, LOL. But I didn’t feel deterred- I knew this was going to be a long learning process and I gave myself a lot of room to mess up and learn. I took a break from heels and focused on lasting flat shoes and slippers and got pretty good at those, then I learned how to make sandals and Birks. 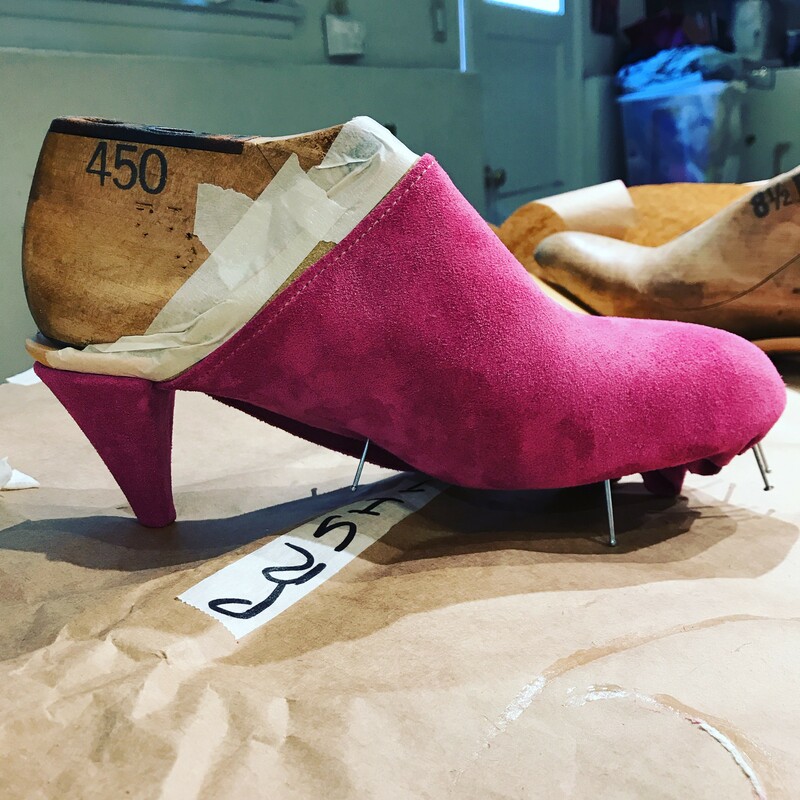 A lot of time had passed since I had made my first pair of heels but I kept accumulating information and getting better at some of the basic steps that applied to both heels and closed-toed flats (like skiving and applying a toe puff and counter). Last year I got the high heel bug again when I was hunting for a pair of shoes that I could easily picture in my head but that I could not find anywhere in stores or online, so I decided I would try and make the pair I was looking for myself. The design was a classic open toed heel slide (reminiscent of the style that Candies used to make back in the day). 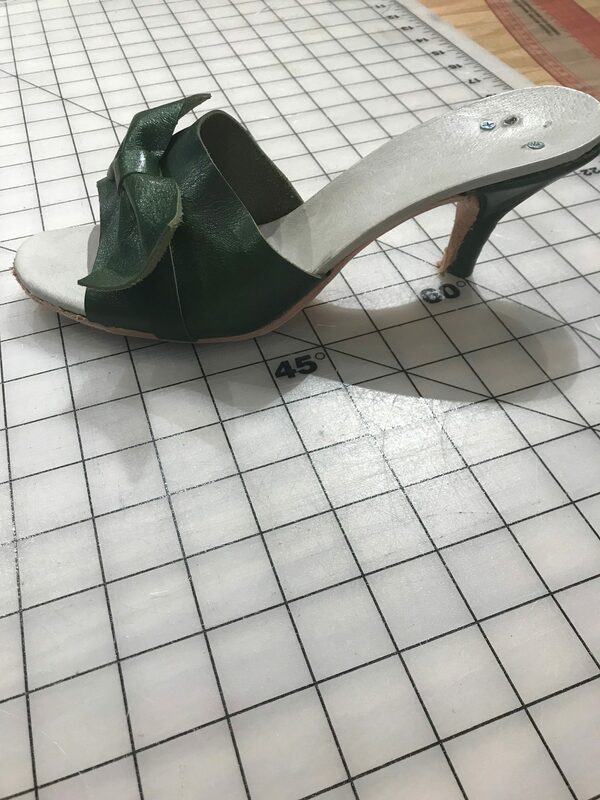 Mine were made of a vintage-looking green leather and I topped the upper off with a little bow and was SO happy with how the shoe looked on the last. This time my skiving was much better and I knew to put cork granules on the bottom before I attached my sole to fill in the gaps between my shank board and leather upper pieces. But once I put the leather soles on the bottom the shoe looked sloppy and messy and very unprofessional. It occurred to me that I should have finished the soles of the leather before I glued them to the bottom of the lasts instead of trying to do it afterwards and risking messing up the edges of the upper leather and insoles. 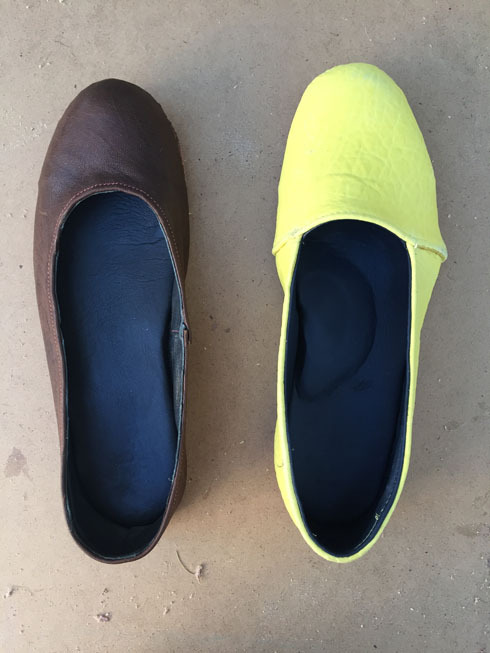 It also occurred to me that I could try skiving the edges of my leather so that they weren’t so thick on the edges of the shoe. The last new thing I tried on these heels that required a learning curve was drilling screws into the top of the heel through the insole of the shoe. Although I am very comfortable with an electric drill, this part made me really anxious. There is a metal bar installed in most plastic heel components that give it the structure and durability it needs to carry your body weight, so the screw you drill in has to be short enough that it doesn’t hit this metal part, but the screws also have to be positioned so that they don’t hit the shank of the insole (another piece of metal used in the board of a pair of heels- basically a long, thin plate that travels underneath the bed of the foot into the heel area of the shoe to provide support and stability for the shoe). And lastly, the screws also need to be placed at an angle so that they don’t come out the other side of the heel. It requires a steady hand and thoughtful planning, and since I had never done it before, I was terrified I would destroy the shoes. And I did! But I had already come to the realization that the heels were looking a bit too rough to be wearable anyways, so once I started treating them as more of a shoe muslin, I felt less scared about ruining them; it’s the only way to get better, right? Of course, two screws sticking out of the top of a pair of heels doesn’t seem very comfortable at all, but pretty much all RTW heels have them, manufacturers just use specialty screws and are able to cover them up in a way that the wearer would never notice them. I knew that I would need to use foam to cover this up and protect the bottoms of my feet and decided to implement that idea on my next pair. 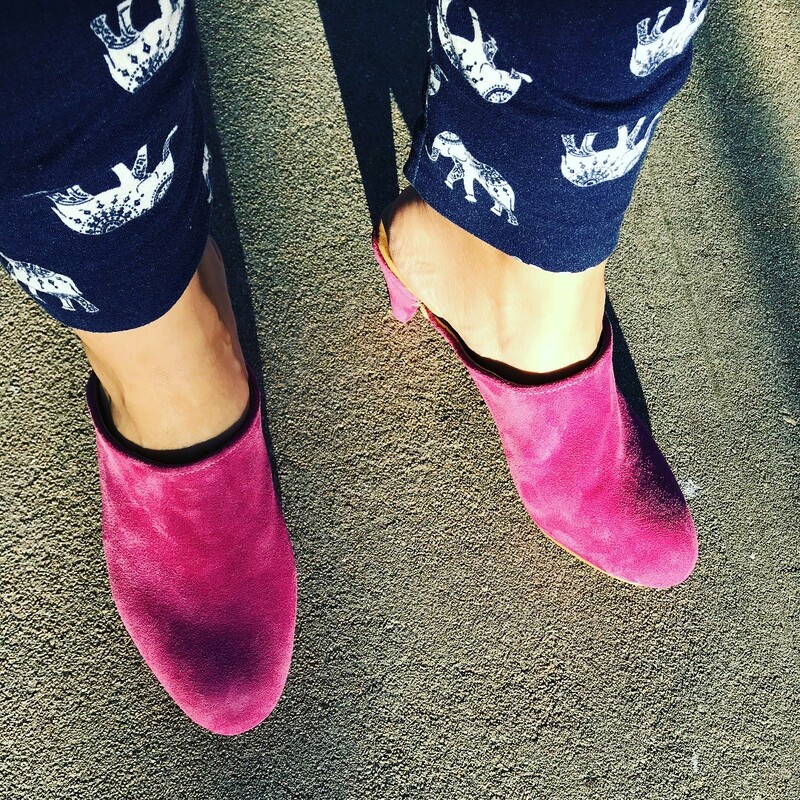 Which brings us to today and these pink mules! I was able to apply pretty much everything I learned from my first pairs of muslin shoes to these, and it shows- they are hands down the cleanest-looking, most comfortable pair of heels I have made. Not without their issues and mistakes, of course, but wearable? YES! Everything went smoothly up until the end when I pulled the shoes off the lasts and tried them on. They felt much too loose! Lengthwise they were fine but the upper had a lot of space around it and they were difficult to walk in because of that. 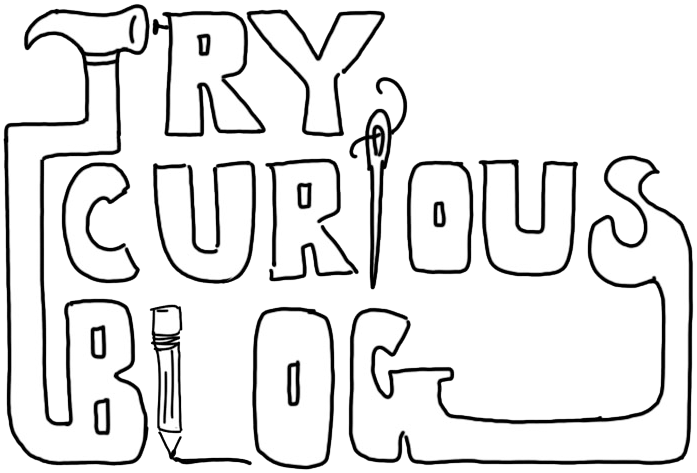 I felt so defeated and frustrated- how steep was this learning curve supposed to be? After so many failures I thought I would have been much closer to wearable heels by now. But then I had the bright idea of adding a thicker insole to the shoe than I normally would have. I used foam board, the same material I use to create an insole for a lasted shoes, instead of just plain foam, and it worked a treat! It completely covered up the screws installed in the heel area and sucked up all the extra space in the upper so that my foot felt snug and comfortable. The edges of my leather sole on the bottom of the shoe look professional and tidy, but I miscalculated the length of leather I would need to meet the heel on the bottom and I fell short a millimeters, so I had to cut out slivers of soling leather to make up for the space. It’s not a big deal since you can only really see it if you are looking at the bottoms of the shoe, but it’s definitely something to work on for next time. I also have trouble getting my heel completely flat onto the bottom of the heel bed. There are machines that smoosh the heel onto the bottom without any gapping or bunching of the leather, but I don’t have one, so I have to use pure muscle to make it happen and the result is just so-so. It might help to skive the leather around the heel component and heel of the shoe even more so that there is less bulk there, but again, something that will hopefully get better with practice. Once I added my cushy insole to the shoe I felt a hundred times happier with them. 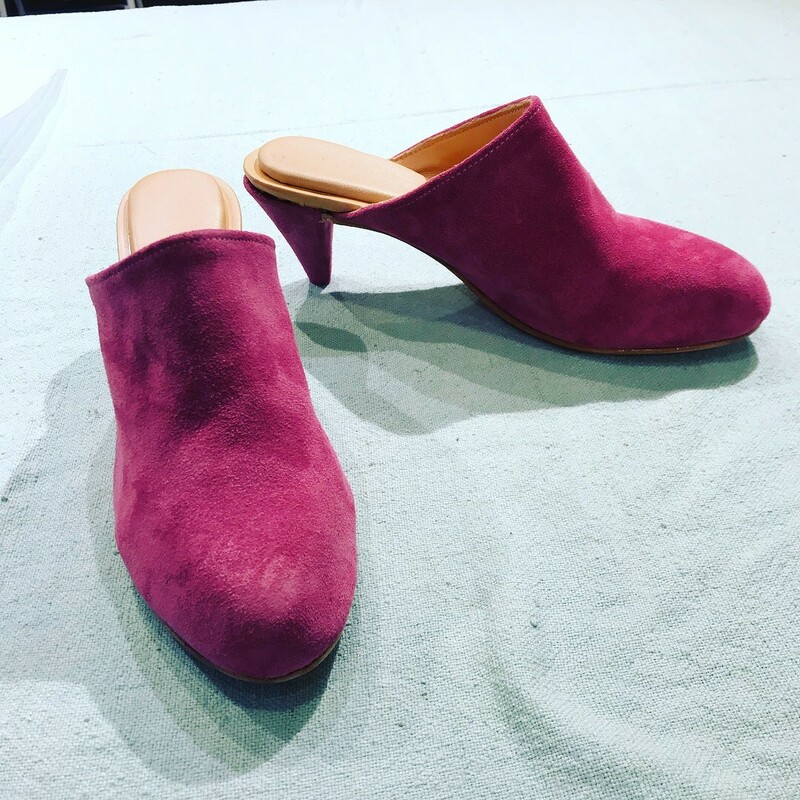 I wore the heels to an interview with Pride.com a couple weeks ago and pretty much every person I crossed along the way had something nice to say about them; fuschia pink mules stand out, which I love! Although the shoes are comfortable and wearable, I am very thoughtful about walking in them. I don’t feel like the heel will come off, but I do feel like if I were to step the wrong way or accidentally walk on a rock that I didn’t see on the ground, I could trip over myself. 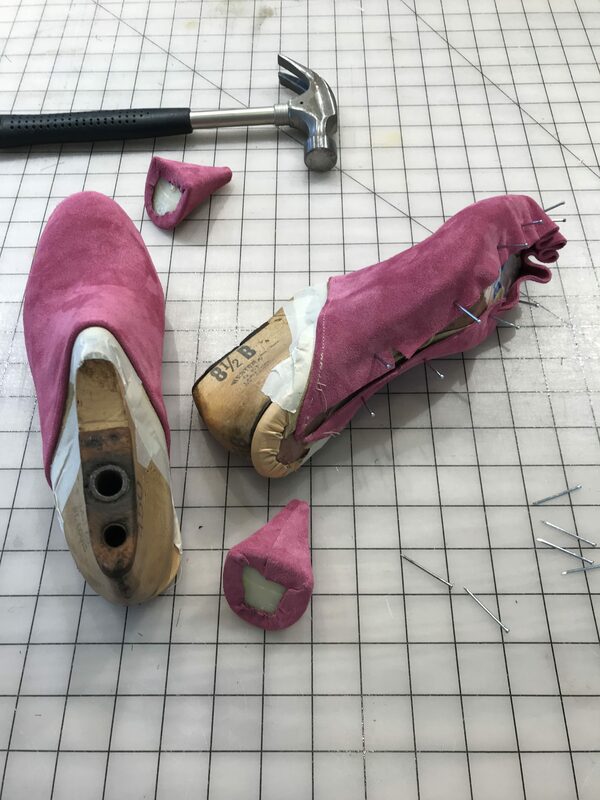 I think this again has to do with getting the heel component smashed up very tightly to the bottom of the shoe, and I wonder if next time I could try and rig a vice grip along the heel of the shoe and the top of the last to press everything together after the rubber cement is applied. I think I might also be more interested in some thicker, chunkier heels that will create a bit more stability for weight distribution than these thinner ones, so I ordered a few pairs from an online supplier I like and hopefully I will get to experiment with them and find great success! I still have tons more to learn obviously, but this pair feels like a huge win and I hope they just keep getting better and better.